If you like to reconnect your electricity supply after being disconnected by the power company, you should learn from Chibuike Okeke’s story. 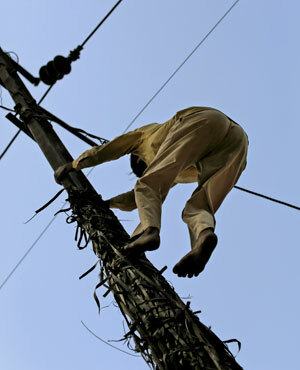 The police on Friday arraigned the 38-year-old man in a Lugbe Magistrates’ Court, Abuja, for allegedly reconnecting electricity from Abuja Electricity Distribution Company (AEDC) network without authorisation. Okeke, who is the hotel manager of Adams Hotel, Zone 7, Lugbe, Abuja, is facing a two-count charge bordering on joint act and theft. The prosecutor, Ndidi Ukoha, told the court that one Augustine Ubani, a staff of AEDC on Aug.24, reported the matter at the Lugbe Police Station. The prosecutor alleged that the defendant illegally reconnected electricity into the hotel from AEDC pole, after earlier disconnection of the hotel over failure to pay accumulated bill of N192, 626. The prosecutor alleged that on inspection, it was discovered that the defendant had been consuming electricity in the hotel without authorisation. The defendant, however, pleaded not guilty to the charges, while the Magistrate, Samuel Idhiarhi, granted him bail in the sum of N100, 000 with a surety in like sum. The case was adjourned until November 15, for hearing. The prosecutor said that the offences contravened the provisions of Sections 79 and 287 of the Penal Code and it appears there is no way Chibuike will escape without some punishment.